On 19 July, Ghana’s finance minister, Ken Ofori-Atta presented the New Patriotic Party’s (NPPs) mid-year fiscal policy and review of the 2018 budget to parliament. The presentation follows the earlier presentation of the 2018 budget in November 2017. It provides an overview of recent macroeconomic developments, revenue-expenditure analysis, a revised 2018 fiscal outlook, and budget implementation highlights as well as key policy initiatives. According to the finance minister, the overarching goal of government’s macroeconomic policy is to deepen macroeconomic stability, grow the economy through resource-based industrialisation, improving the business environment, social sector investments, creating jobs and ultimately move Ghana beyond aid. In line with this reform agenda, the 2017 and 2018 budgets attempt to significantly shift the policy environment from one overconcentrated on taxing a few industries and the formal economy. This is being done by reducing the overall tax burden through VAT reductions, scrapping of the so-called nuisance taxes and digitising government services – for example, land registry, ports, DVLA and passports to curb corruption. Ghana’s largely import-dependent economy, despite recent global headwinds from strengthening US dollar, exhibited robust and resilient performance with significant improvements in several core indicators since 2016 as can be seen in Figure 1 below. 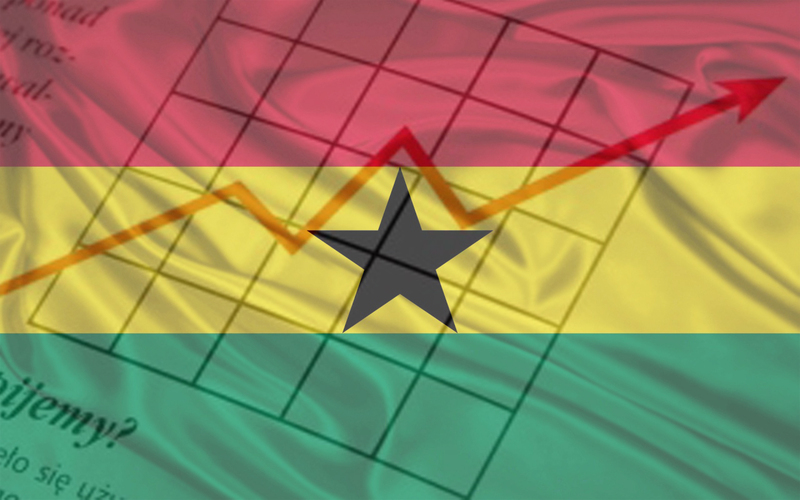 For example, official statistics compiled by the Ghana Statistical Service (GSS) indicate that the economy grew at 8.5% in 2017 compared to an original projection of 6.3% versus 3.7% growth in 20016. The latter was caused primarily by the three-year electricity crisis (‘dumsor’) from 2013 to 2016. At the same time, inflation declined from 15.4% in December 2016 to 11.8% in December 2017 whereas the fiscal deficit has reduced from 9.3% at the end of 2016 to 5.9% at the end of 2017. Despite these positive developments, government revenue and expenditures for 2018 have been underperforming (below their respective targets) although the revenue shortfall is much bigger than expenditures. This requires making a net fiscal adjustment of 0.4% of GDP to achieve a 4.5% fiscal deficit target in line with programme commitments including the IMF’s Extended Credit Facility Agreement which has been extended by a year from April 2018 to April 2018. In furtherance of this, various tax policy proposals were announced in the revised budget including changing the mechanics of the value-added tax (VAT) computation while maintaining the headline rate at 17.5%, imposing a luxury tax on vehicles with capacity greater than 3.0 litres, and addition of a new 35% income tax band for those earning GHS10,000 per month and above. The new policy aligns with government plans to broaden the tax net, enforce tax compliance and increase fiscal receipts to plug Ghana’s budget deficit and reduce the public debt stock. Has VAT Increased or Not? New VAT Structure:5% VAT (computed as an input-output tax) + 2.5% GETFund levy (based on transaction values) + 2.5% NHIL (based on transaction values). Hence, the rate stays the same but the amounts collected will increase and subsequently the overall tax burden. We can see the effect in Figure 2 below, illustrating with a dressmaker who purchases a fabric from Makola market costing GHS90 as raw material input and eventually sells the dress made using the fabric at GHS100, all without VAT (ex-VAT). Under the new VAT scheme, the dressmaker will pay a combined 5% GETFund and NHIL levy amounting to GHS4.5 but they cannot recover this as an output tax credit which was the previous case as this is now not cost recoverable. It becomes a business expense. Normally, when businesses buy things, the VAT cost of the raw materials such as VAT is supposed to be fully reimbursed. However, by the government of Ghana decoupling the 5% NHIL and GETFund component of the VAT, this levy (business tax) becomes a business cost which is non-reimbursable. The dressmaker subsequently sells the good at GHS117.50 but their net profit before VAT becomes GHS5.50 (GHS100-GHS90+GHS2.25+GHS2.25) whereas the net VAT and levies paid by the business to the government (GRA) become GHS6.25 (12.50-11.25+2.50+2.50). Hence, most business will have to decide whether to absorb this extra 5% charge, eating into their profit margins or pass this on to the consumer although the latter is more likely to be the case. What is constant in all of this is that the government will still earn more money by the change. So yes, some of these ’new taxes’ are likely to be passed on to consumers but the extent will depend on the elasticity of goods and services demanded to price changes. And there is the wider strategic angle of the potential impact on our overall competitiveness as a country. How Will New 35% Income Tax Affect You? The finance minister also reviewed personal income taxes to include an additional band of GHS10,000 and above per month at a rate of 35%. But how will it affect you? It is important to state that no one will be paying 35% on salaries worth GHS10,000 and above. Why? Ghana employs progressive personal income taxation scheme where persons are required to pay income tax at graduated rates (bands) when their income gets to these bands. Previous payments are deducted prior to calculating the next band. To illustrate this, Figure 3 below shows the effective tax rates for someone earning GHS12,000 per month in Ghana. Under the old scheme, this person would have paid a total PAYE income tax of GHS2,695 representing an effective tax rate of 22.46% whereas the tax increases to GHS2,895 representing 24.13% effective tax rate under the new scheme. This person will pay about GHS200 per month extra or GHS2,400 per annum assuming they were not getting any additional tax credits/allowances. The net incremental effective tax rate is 1.67%; that is, 24.13 less 22.46%. The amount paid in taxes is even likely to further come down when one includes additional tax credits/allowances such as SSNIT contributions. Assuming 70,000 working Ghanaians in this higher bracket earning GHS12,000 per month, then the additional taxes likely to be raised by this measure will amount to GHS168 million every year. Notwithstanding Ghana’s renewed growth momentum and economic turnaround supported by increasing commodities (crude oil, gold, and cocoa) output, fiscal pressures are likely to remain high, driven by increments in the public wage bill (~45% of tax revenues vs 35% tax revenue target), rising interest payments (~6.5% of GDP) and relatively weak domestic tax mobilisation efforts. The long-term dominance of primary commodity exports and cyclicality of commodity prices exposes Ghana to negative trade shocks with consequential impact on cedi depreciation and debt servicing risks. It must be noted though that Ghana’s external sector since 2016 has witnessed some improvements through a positive trade balance and surplus capital account – for example, 2.3% balance of payments in2017 vs 0.6% in 2016. While the attempts to increase domestic tax mobilisation through the setup of a special ttask forceto enforce VAT and ensure revenue compliance including prosecutions of persons and companies for tax evasion and malfeasance is welcome, we also need to double our efforts to plug revenue leakages, particularly in the extractives sector (mining and oil and gas) through forensic audits of national and multinational companies on transfer pricing and illegal financial flows. To this end, the Ghana Growth and Development Platform (GGDP), of which I am a member, will be happy to assist the government with suggestions on cost auditing, hydrocarbon accounting, ring-fencing of taxable receipts and progressive windfall taxation. Also, the proposed infrastructure financing model through leveraging of natural resources under a swap/barter arrangement to provide USD2 billion of infrastructure (roads, hospitals, housing, interchanges, etc) in exchange for refined bauxite needs to have broader stakeholder consultation. 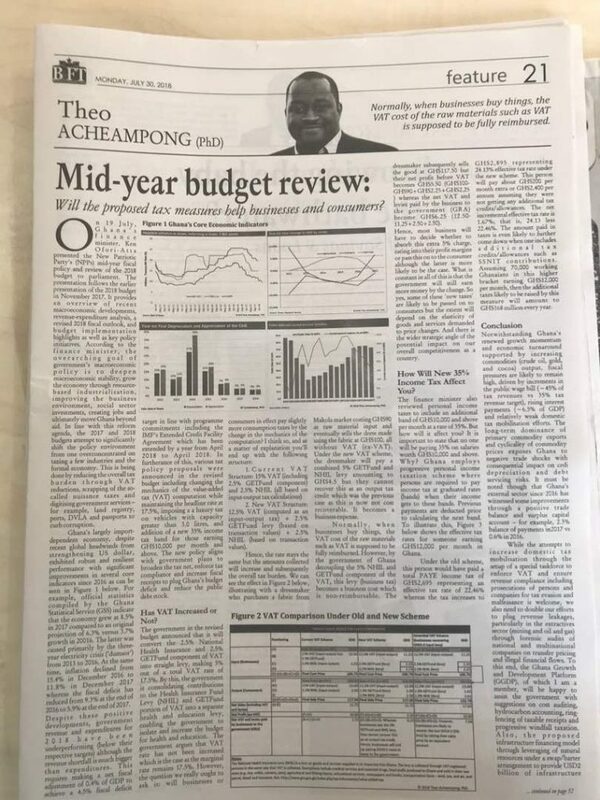 Finally, on the tax policy proposals in the mid-year budget, I hope the Association of Ghana Industries (AGI) and other business groups will increase their lobbying efforts before the amended VAT act is passed by parliament to give effect to the changes. For the GETFund and NHIL changes to become effective as standalone levies, the government will need to make an amendment to Value Added Tax Act, 2013 Act 870. Ghana’s business associations need to be more proactive in utilising evidence-based research, for example on trade and industrial policy, to support their lobbying campaigns. In addition, I will also advocate for the Ghana Revenue Authority (GRA) to as a matter of priority, issue Practice Notes on how the GETFund and NHIA components will now be computed. This will be similar to the Practice Notes that GRA issued last year when the marginal 3% VAT Flat Rate Scheme was introduced. BN: First published in the Business & Financial Times (B&FT) on 31 July 2018. The writer is an economist and political risk analyst with expertise in providing economic and investment analysis as well as research and strategic advisory. His work focuses on regulatory and commercial issues within the upstream oil and gas, power and downstream energy industry, and macroeconomic and policy analysis. He is the Acting Chairman of the Ghana Growth and Development Platform (GGDP).